The finance and banking sector count among the fastest changing and developing sectors in Turkey since the beginning of the year 2000. The finance and banking sector count among the fastest changing and developing sectors in Turkey since the beginning of the year 2000. Standing out from other banks in the world with their newly developed products, Turkish Banks have also advanced their local banking population in the meantime. Another fact worth mentioning about the finance sector is their gradual acquisition of an international identity thanks to their increasing capital and solid risk policies. Consequently, large international partnerships look upon Turkey and its rising banking sector as a world of opportunities. Conversely, tough competition leads banks to look for innovative ways not only to win new customers but also retain the existing ones. At the 2nd Call Center Summit which took place last May, 2nd Mr. Mehmet Akgün, Customer Contact Center Group Manager of ING Bank, one of the strongest international players of the Turkish banking sector, participated in the ‘Sustainable Customer Satisfaction Forum’ organised by Mi4biz. At the forum, I asked Mr. Akgün what the company did to become a preferred brand in today’s tough market conditions where customers are ‘kings’. 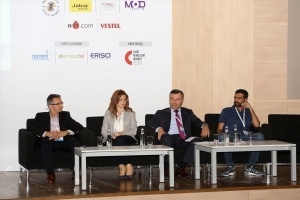 Mehmet Akgün mentioned that the secret to success lay in establishing not only rational but also emotional bonds but also emotional bonds with customers and managing communication processes accordingly. I am talking about a bank which tries to offer the best solutions to its customers and establish emotional bonds with them using voice response systems (IVR) at each step of the customer relations management process. For instance, I was surprised to hear that when a customer whose Internet branch password has been blocked contacts the call center, IVR intervenes directly in the process to redirect the customer to an operator and remove the password blockage. The fact that IVR tries to guess the reason of the call and offers the customer a special menu of options is one of the first steps towards building an emotional bond with customers based on a solid foundation. Another issue I have dwelt upon with emphasis during my talk with Mr. Mehmet Akgün was customer satisfaction measurement tools and methods. As we all know, INGBank has been chosen as the corporation which deals with customer complaints in the most efficient way two years in a row. What is the secret behind making your customers happy and the successful management of customer complaints? INGBank does not just use Standard customer satisfaction measurement tools such as NPS (Net Promoter Score). Besides, it analyses both internal data as well as external data gleaned from the social media and web portals. Especially, the efficiency of steps created for the resolution of customer issues, analysis of the root factors causing customer dissatisfaction and taking the right course of action to remove those factors are among the reasons underlying this achievement. Mr. Akgün gave the signals of their plans to take another pioneering step in the sector. Since today’s customer tends to perform transactions via channels that offer the best user experience, bank call centers aim to increase service satisfaction by making call center services as accessible as possible. In other words, the services customers receive on the phone from the branches will be on the same standards with the services they receive from call centers. This will also allow the services to be executed according to uniform quality standards on all channels. We all know that bank customers in Turkey log more complaints than their counterparts in Europe. Customers of Turkish banks especially complain a lot about product and service costs, owing in part to the negative public perceptions of banks. Customers influenced by the news on the media reach their banks saying that they do not wish to pay for the product prices. The uniformity on all channels of all the efforts expended and the methods used to sway the public opinion towards a more positive view of banks leads to the formation of a more consistent approach to customer care, which in turn brings better results in terms of customer experience. Therefore, the putting in place of service standards in the management of customer complaints and in ensuring customer satisfaction is a grueling task for large multi-channel organizations such as banks. INGBank has tackled the conundrum with a practical software solution which teaches its users the complexities of process management: Mi4biz… Thanks to Mi4biz users on all channels are able to learn how to manage customer communications following a predefined process the moment they define an incoming communication from a customer.. Thanks to the knowledge database of the Mi4biz app, they instantly learn quite a few useful tips from other users on how to manage the processes they are responsible for and resolve the customer issue at hand, just like in search engines. This makes Mi4biz not just a platform where actions are performed; it is also an information sharing platform which teaches us how to perform actions. The most important aspect of adult education is ‘learning by practice’. INGBank designs and manages its work processes using Mi4biz for its employees to learn how to deal with the incessant flow of incoming customer communications according to set company standards. INGBank took a resolute step forward to ensure sustainable customer satisfaction using the right technologies. Creating acceptable service standards in today’s competitive market conditions is among the foremost of the hurdles the banking sector has to overcome. Corporations who take the right actions to turn this barrier into an opportunity will be led by customer-oriented technologies.